The reverse osmosis water purification equipment can be filled into container(20’ or 40’) conveniently. Not only easy to transport, but also helps to flexibly accustomed to construction site changing. Containerized RO plant is no problem for field lifting, moving and easy operation. Another, operation management has been greatly facilitate the equipment running. 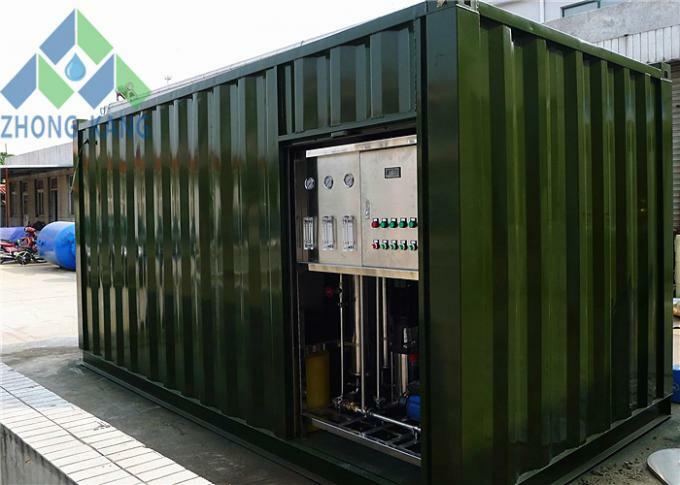 Containerized type RO unit avoid the pipeline and device installation between different treatment units, and no need for large number of civil works. This reduces investment cost for the project, especially for those in remote areas, such as island regions. Plug and play type, only need to connect the power and feed water, then fulfill the demands of fresh water. The system solves the problems of frequent regeneration and cleaning during the use of ion exchanging water purifier. 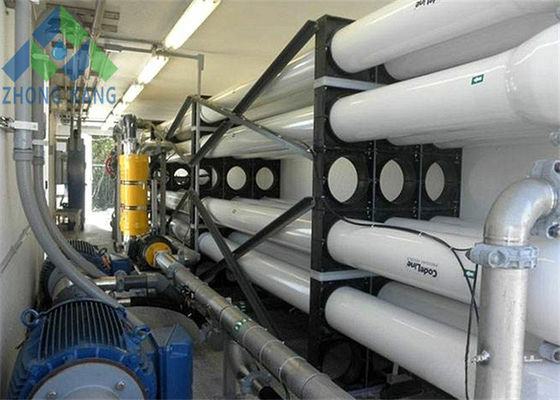 By adopting physical principle, the RO water purifier transport feed water to pass the reverse osmosis membrane with a diameter of one ten-thousand of a micron and separates impurities, ion, microbes and colloids in the water, so as to obtain fresh water. Reverse osmosis plants are based on membrane technology that removes approximately 98% salt from the water thus making in suitable for drinking as well as for industrial use. We treat water from well, river and sea as per the customer’s requirement. Our plant are compact, skid mounted, factory assembled and tested before delivery to assure best quality and smooth operation. The capacity ranges from 1 m3/hr to any size you need. Continuous water production without the need of regeneration, reducing labor cost. RO membrane imported from USA, with a high desalting rate of 97~98%. Removing 98% of organic matters and bacteria, with a heat source of more than 98%. Online electric conductivity monitoring, to ensure good output water quality. PLC microcomputer monitoring, flushing the RO membrane timely. Automatic stopping in case of low pressure water shortage and high pressure water sufficiency. 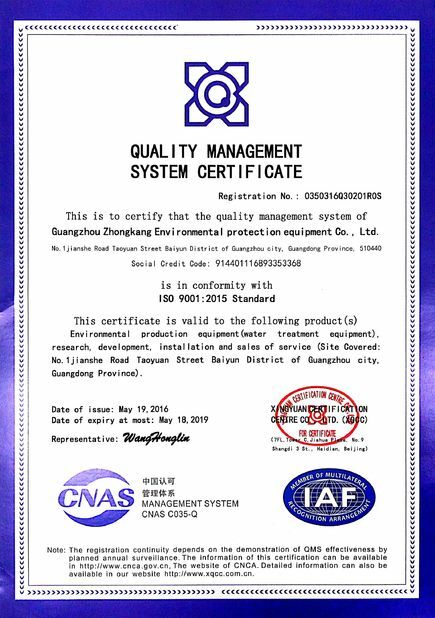 Output Water Quality: Meet the World Health Organization(WHO) Guidelines for Drinking Water Quality, also can be customized via detailed requirements of clients. Rated power: Depended on feed water quality and treatment capacity. 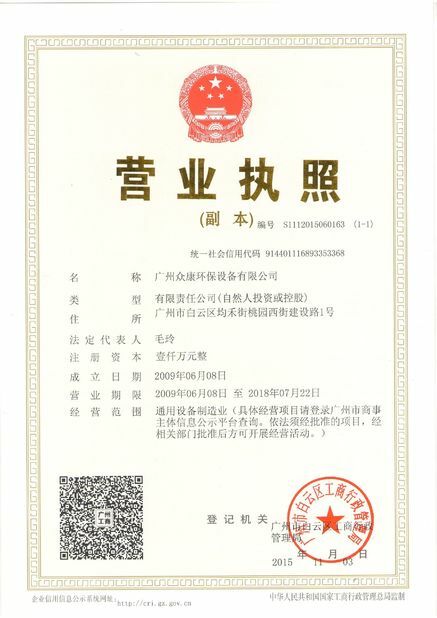 Electrical Parameters: 3 phases, customized via different country.